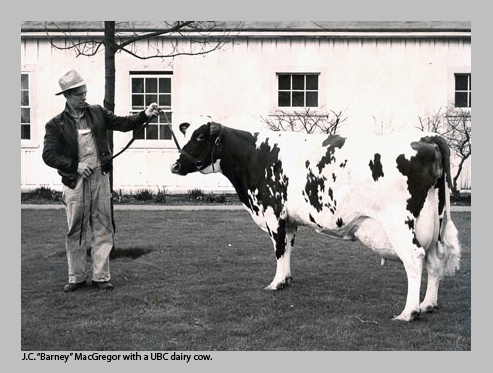 UBC transfers its dairy herd, milk quota and equipment from the Point Grey campus to Agriculture and Agri-Food Canada (Agassiz) . UBC and AAFC sign a Formation and Operation Agreement and a Lease Agreement outlining terms by which AAFC agrees to provide UBC its dairy herd and certain related equipment, land and facilities located in Agassiz to UBC in order that UBC establish a Dairy Education and Research Centre on AAFC leased land. Some of the UBC Oyster River Farm’s dairy resources are transferred to AAFC. UBC completes construction of a new 180 lactating cow research building containing a double-12 parallel milking parlour, administration offices, and a small dry-lab research area. UBC completes construction struction of the 120 cow Feed Intake Research Facility. UBC’s Department of Civil Engineering establishes the Energy and Nutrient Recovery Facility on site. UBC completes construction of the Heifer Research Facility and the Westgen Calf Research Facility. UBC completes construction of the Student Housing building.